Already at the begin of April, I had a phone conversation with my representative at Emtel Ltd. about some upcoming issues due to the ongoing construction work in my neighbourhood. Unfortunately, they finally raised the house two levels above ours, and of course this has to have a negative impact on the visibility between the WiMAX outdoor unit on the roof and the aimed access point at Medine. So, today I had a technical team here to do a site survey and to come up with potential solutions. Short version: It doesn't look good after all. Well, the two technicians did their work properly, even re-arranged the antenna to check the connection with another end point down at La Preneuse. But no improvements. Looks like we are out of luck since the construction next door hasn't finished yet and at the moment, it even looks like they are planning to put at least one more level on top. I really wonder about the sanity of the responsible bodies at the local district council. But that's another story. 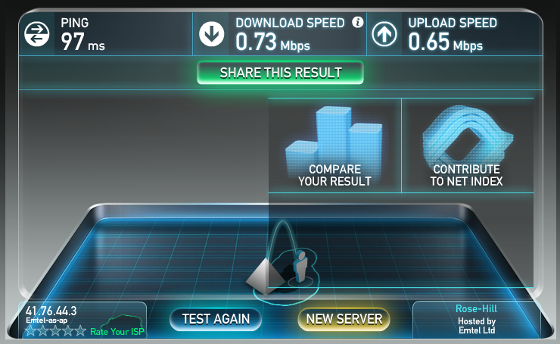 Dear Emtel, could you eventually provide an answer on the miserable results of SpeedTest? Sadly, no response to this. Seems that the marketing department is not willing to deal with customers on Facebook. Okay, over at speedtest.net you can use their Flash-based test suite to check your connection to quite a number of servers of different providers world-wide. It's actually very interesting to see the results for different end points and to compare them to each other. Luckily, the results are quite similar in terms of connection speed; which is good. I'm currently on a WiMAX tariff called 'Classic Browsing 2', or Fixed Broadband as they call it now, which provides a symmetric line of 768 Kbps (or roughly 0.75 Mbps). In terms of downloads or uploads this means that I would be able to transfer files in either direction with approximately 96 KB/s. Frankly speaking, thanks to compression, my choice of browser and operating system I usually exceed this value and I have download rates up to 120 KB/s - not too bad after all. Only the ping times are a little bit of concern. Due to the difference in distance, or better said based on the number of hubs between the endpoints, they indicate the amount of time that it takes to send a package from your machine to the remote server and get a response back. A lower value is better, and usually the ping is less than 300 ms between Mauritius and Europe. Not sure whether I should note this done because for my requirements there are no alternatives to Emtel WiMAX at the moment. It would be great to have your opinion on the situation of internet connectivity in Mauritius. Are there really alternatives? And if so, what are the conditions? From time to time you should check the speed of your internet connection. 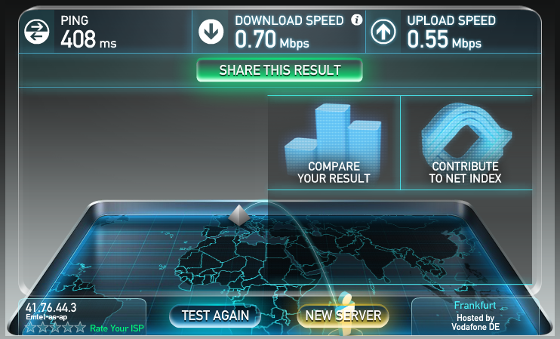 Here are my observations on Emtel Mobile Internet. The Mauritius Software Craftsmanship Community was founded based on the necessity to have a strong off-line and on-line community in Mauritius.